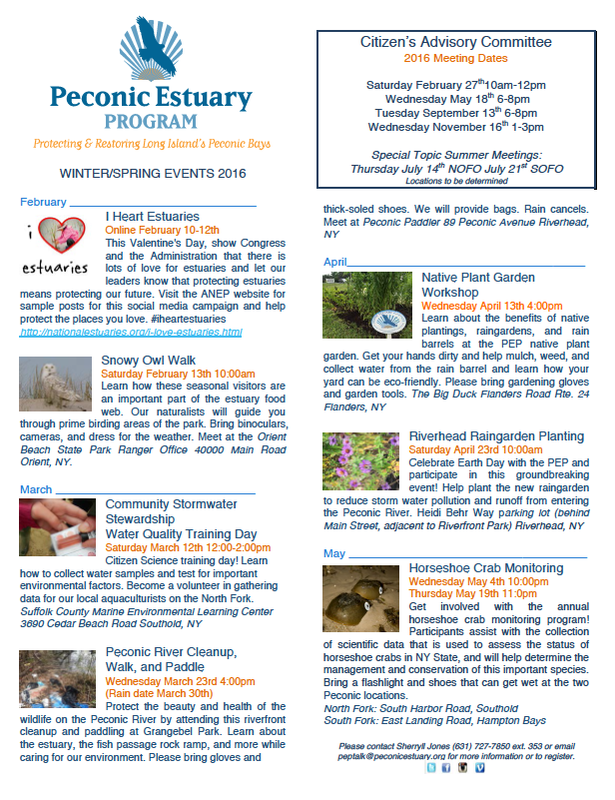 The Peconic Estuary Program, established in 1993 when the Peconic Bays were declared an Estuary of National Significance by the U.S. Environmental Protection Agency, is planning a slew of late winter and spring events surrounding the Peconic Bays. Coming up February 10 through 12 is the annual national “I Heart Estuaries” Twitter campaign, designed to show Congress and the Administration the love that people feel for the estuaries throughout the United States. Estuary programs throughout the country are asking people to get out and take photos of their local estuaries and share them on social media with the hashtag #iheartestuaries. More information on the program is online here. Also in February, the Peconic Estuary Program is planning to hold a snowy owl walk on Saturday, Feb. 13 at 10 a.m. at Orient Beach State Park. The East End has seen a flurry of snowy owls the past few winters, and birding experts will share what they know about the prime snowy owl areas of the park and the role the owls play in the estuary food web. The group is meeting at the state park’s Ranger Office. On March 12 from noon to 2 p.m. at the Suffolk County Marine Environmental Learning Center at Cedar Beach in Southold, PEP will hold a Community Stormwater Stewardship Water Quality Training Day. At the event, they’ll teach citizen scientists how to collect water samples and test for environmental factors, enabling them to become volunteers to gather data for aquaculturists on the North Fork. On Wednesday, March 23 at 4 p.m., PEP will lead a Peconic River cleanup, walk and paddle, which meets at the Peconic Paddler on Peconic Avenue. They’ll provide information about the fish passage rock ramp and the estuary while helping to clean up the river in Grangebel Park. The rain date is March 30. In April, the Peconic Estuary Program is hosting a native plant garden workshop at the Big Duck on Flanders Road in Flanders on Wednesday, April 13 at 4 p.m. PEP will teach attendees about the benefits of native plantings, rain gardens and rain barrels at the PEP native plant garden at the Big Duck. You’ll also have a chance to help mulch, weed and collect water from the rain barrel and get tips on how to make your yard more eco-friendly. Bring gardening gloves and tools if you have them. The Peconic Estuary Program is still offering its rewards program which provides financial assistance for people who live in the Peconic Estuary watershed who want to install rain gardens, native plantings or rain barrels at their houses. More information on the program is online here. On Saturday, April 23 at 10 a.m., PEP is celebrating Earth Day by planting a new rain garden in the main parking lot along the Peconic River behind Main Street in downtown Riverhead. The garden will be designed to reduce stormwater pollution and keep runoff from entering the river. For night owls and horseshoe crab lovers, May is the time to begin monitoring horseshoe crab mating patterns. On May 4 at 10 p.m. and May 19 at 11 p.m., volunteers will be meeting at the end of South Harbor Road in Southold and at East Landing Road in Hampton Bays to collect scientific data to use to assess the status of horseshoe crabs in New York State. Attendees are being asked to bring a flashlight and shoes that can get wet. The Peconic Estuary Program’s Citizen’s Advisory Committee will meet on Feb 27 at 10 a.m., May 18 at 6 p.m., Sept. 13 at 6 p.m. and Nov. 16 at 1 p.m. this year, and will be holding special topic summer meetings on July 14 on the North Fork and July 21 on the South Fork. Locations for these meetings have not yet been determined. ← So You Want to Be a Shellfish Farmer?